When the Hangover franchise is looked at as a whole, it’s interesting to view the entire storyline as being focused on Zach Galifianakis’ Alan. In the first movie he is brought out of his shell and winds up having the best night of his life with Phil (Bradley Cooper), Stu (Ed Helms) and Doug (Justin Bartha), some of the few people in the world who he can call friend. The sequel is then Alan’s desperate attempt to reach out again and try to recreate the bonding magic of the Wolfpack’s first night together – though it winds up being a disaster if gauged by the anger it induces in his friends. So at the beginning of Part III we find Alan as a broken, lonely, sociopathic, off-his-meds rich kid with zero discipline. It’s not hard to see why co-writer Craig Mazin and co-writer and director Todd Phillips decided it was Alan that the final movie needed to center around. For the end of the Hangover franchise Warner Bros. organized a press day in Las Vegas where myself and a group of other journalists had the chance to talk with Phillips and Mazin about the franchise finale, The Hangover Part III. You can read the conversation below, the two filmmakers talking about not just putting more focus on Alan’s story, but also the extra challenge that comes with making a dark comedy, inserting special callbacks and Easter Eggs into the story, and making sure to maintain a certain tone. Did you know when you finished The Hangover Part II where you wanted to go with Part III? Todd Phillips: We talked about it while we were making [Hangover] II, about what we would do. We knew we wanted to do another one. There’s probably five legitimate different versions of The Hangover III in terms of directions it could have gone. We didn’t settle on this one until we sat down in the summer and started to write - two summers ago. Craig Mazin: Prior to that there were some big ideas. He would call me. I would call him and say, “Ok that is a big idea.” But then there was a moment where you sort of say, “Ok, here are these three or four big plot points. Let’s talk about how this is actually a movie. How is satisfying? Why do we care and how do we make this a true end, so that it in fact ends.” It needs to end. Todd Phillips: Yeah, exactly. We really wanted it to feel like an ending. We really thought Alan was the one character that needed to be healed still, and it just felt naturally that it should be Alan’s story. I’m curious about the darkness of this franchise, because it’s gotten darker with every installment. This is a hugely successful movie for Warner Bros., so I’m wondering if that allows you more creative freedom, and if that freedom is what led you to bring it to darker places. And what is the appeal of making such a dark film within the comedy genre as opposed to making a drama? Todd Phillips: It’s cooler. It seems cooler. [laughs] Yeah, I think that filmmakers in their very nature are dark people. I think that as you get more freedom, I think if you look at Pirates of the Caribbean, it gets darker as the series goes on because they got a little more freedom and a little more confidence and they got to sort of move their arms around a little bit and I think that’s what happened with The Hangover. I think my tastes tend to lie a little bit... I think if you rewatch Hangover 1, it’s dark too. Yeah, it’s a natural evolution. Todd Phillips: It’s a natural evolution. It just feels like a more interesting place to go with comedy. It’s more challenging because it’s like, “How am I supposed to laugh? They just killed [spoiler removed]. How am I supposed to laugh here?” And two seconds later we have a giant laugh in the movie where Alan is like, “Can you bring me sweatpants?” So, to me, it’s a challenging and more fun way to do it. And, also, I think it gives the movie a little more depth. Craig Mazin: Dramatically you start with a movie and if the second one is, I don’t know, lower stakes, at that point, you might as well just make a movie about the guys raising their kids. Todd Phillips: Well, that’s interesting too. It helps raise the stakes as we go along. I think that happened. I think that’s a good point. Todd Phillips: I think that was me, honestly. Was that from a childhood fantasy with animal crackers or something? Todd Phillips: It’s so random. Yeah, yeah. Craig Mazin: Any other director would have had the giraffe duck. That’s why I like working with this guy. When I saw Due Date and the second Hangover, both of those movies have like a real sort of meanness to the comedy that I feel like this movie actually has less of. Was there a deliberate choice to make this one less mean? 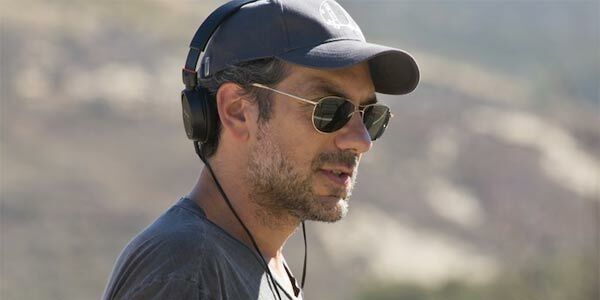 Todd Phillips: I think honestly it’s in response to where the story takes you. Due Date had to feel that way. You had to feel Robert Downey’s frustration and the kind of character he was for him to be healed through the Ethan Tremblay character. Hangover II feeling mean, it doesn’t feel mean to me, but this one is definitely a more emotional film, dealing with Alan’s real life and Alan meeting someone who is equally left-footed as him in Melissa McCarthy. That in and of itself is just going to add a sweetness to it. But it wasn’t an intentional, “Let’s make this less mean.” It’s just where the story took us. So, if you’re going to tackle Alan’s story, it’s naturally going to be a little bit more emotional because he’s naturally a little bit more genuinely fucked up. When you choose to focus on Alan and Chow, who are as crazy as they are, how careful do you have to be to make sure that Bradley and Ed’s character have something to do and that they still have a presence in the film instead of just being spectators? Todd Phillips: I think that’s an interesting question and it’s just something you have to do and you have to be mindful as you do it. It’s the same as saying, you know, when you do an ensemble movie, it’s going to focus sometimes in one direction. It doesn’t mean the other guys are replaceable or don’t need to be there. I feel like, again, it’s always been these three guy’s journey together going through this thing. Alan takes a more active role - but Alan took a way less active role in the other two movies, but he still felt very much a part of it to me. So it was just switching things around. What was the last scene that you shot, the last scene with all of the guys and what was the mood on the set, knowing this was it really? One thing I really liked about this film was its attention to smaller details, and callbacks to the first two films. You have the guy who is throwing the tuxedo from the van in the first one… is Carlos the same kid? I’m curious about implementing those details, not to mention familiar artists on the soundtrack. How do you determine the details that you want to carry throughout the franchise? Todd Phillips: There’s a lot of things like that in the movies that people notice and some people don’t and it’s still cool. I just find it really fun when I see movies and I notice things. So, that’s a pretty astute one, seeing Neeco the tuxedo guy - which is so random, because the truth is Alan does have one friend in The Hangover, and it’s that guy who dropped him the tuxedo. So, of course he’s going to be at the intervention. And that is the same kid from the first one? That is the same kid. Todd Phillips: It’s the baby from the poster. Obviously we had multiple kids when we filmed The Hangover I, but the main kid who is the one from the poster is this kid Grant. So we just called up his mom and dad and we’re like, “Hey, so we’re doing another one...” So, she and Grant came to my office. We just wanted to make sure the kids was like... he’s not an actor, obviously. He’s four and a half, but can he hang? Is he going to cry? But we were hoping, because she sent me a picture and he had those cheeks still. Todd Phillips: Beautiful eyes. I mean he’s such a cute kid. We heard from talking with the actors that you shut down the strip. How’d you get permission to do that? Todd Phillips: You know, Hangover means a lot to this town. It does. It’s a testament. Listen, when Hangover I came out it was a recession. It was the summer of 2009. I literally got a call from a casino CEO, not Caesar’s, a different one, and [he] said, “Hey, I just want to thank you for making Hangover and bringing the young people back to Vegas this summer. It’s done a lot for the town.” So, when we came back for The Hangover III and we have Chow parachuting we’re dealing with six different properties. It’s like asking six movie studios to all work together. They’re competitors. You can’t get Dreamworks and Paramount and Universal to all kind of work together, but they did for The Hangover because of what it meant. So, it was cool. The Bellagio let us control the fountains, even though Caesar’s is really featured in the movie, and then we go here and there and there. So, it was kind of a neat thing, but I think it speaks to the love that Vegas has for the Hangover franchise. It’s fun to have made a movie that is a seminal Vegas film, you know what I mean? Five years from now, if they came to you guys and said, “Come on...” or you had a great idea, would you ever bring it back together or is it really over forever? Todd Phillips: I think it’s over forever with this cast, and us, and me and I think it is over forever. I think this was the last word on it and we’re happy with that. What could possibly be too much? Todd Phillips: Well, it’s not that it’s too much. It’s a tone thing. We try to, believe it or not, really maintain a certain tone in these movies and like you pointed out before, it’s a little darker than before, but it’s always tonally consistent. Sometimes you come up with a joke that we’ll crack up at for five minutes sitting in a room, and then we look at each other and it’s the tone of the movie. Did you have a point where you wanted all of these characters to be at the end of all three films much less this last installment? Craig Mazin: We felt like Stu was at peace. He’d been through the ringer twice. Bradley doesn’t need peace. He’s always been at peace. He’s got a wife and kids. Bradley’s the only cool one who understands how to live on the edge and then return on his own, like an adult. But Alan was the one that needed desperately to grow up. I mean, his father says it to him in the beginning of the movie and we realize it. That’s why, frankly, I love the fact that second movie is about it happening again. You can’t make a third and final movie about how we can finally stop this from happening anymore if it only happens once. That’s why I liked that it happened a second time. So, yeah, that was the goal, was to finish with Alan and once Alan is finished, obviously, the rest of them are in pretty good shape.